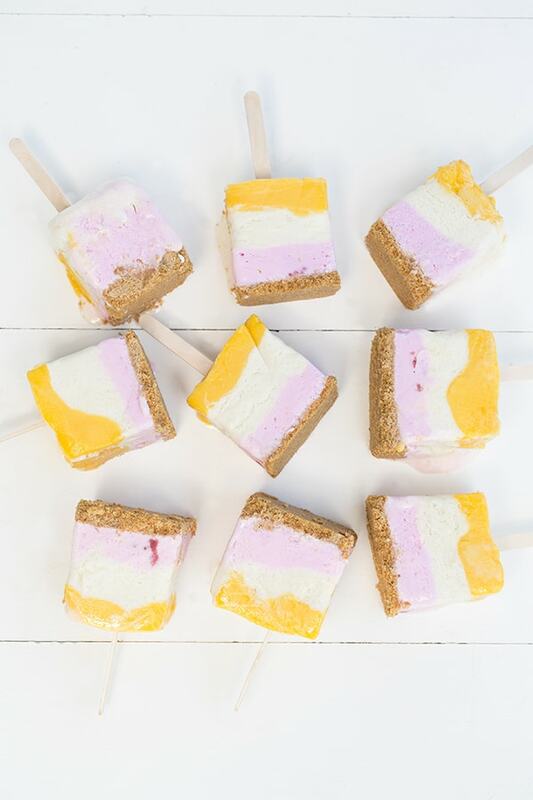 How fun are these layered ice cream pops?! Just choose your favorite ice cream or sorbet flavors to make a triple layered combo with a sugar cone crust! 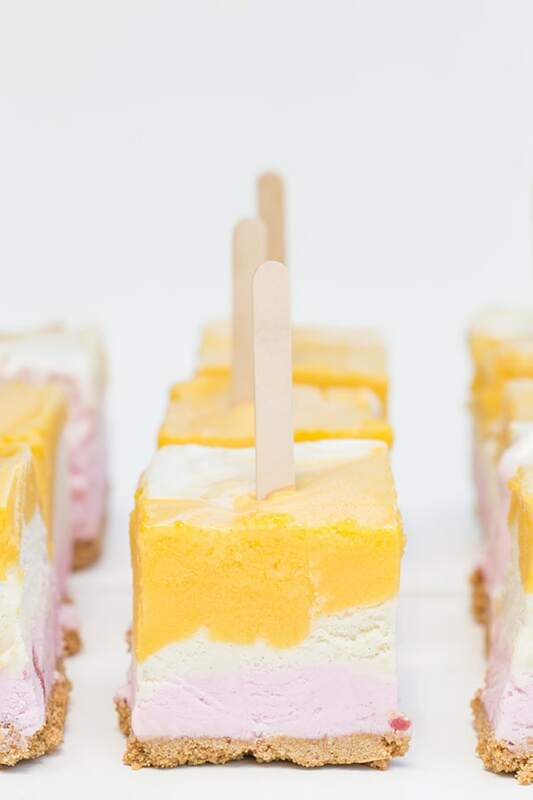 Layered ice cream pops are perfect for summer and make eating ice cream even more fun… not that it wasn’t already fun enough, but a charming presentation is key! 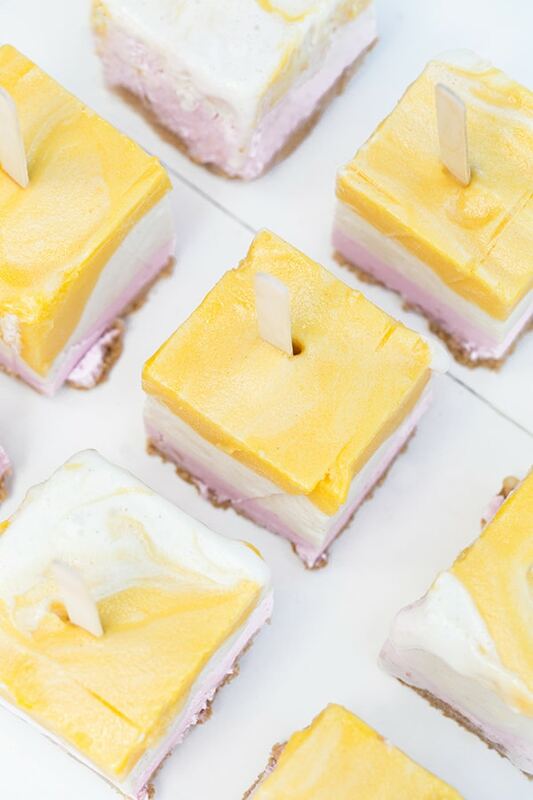 When you break these out, guests will swoon and think you’re a genius for turning ice cream into cute cubes on popsicle sticks. EASY ENTERTAINING! These sweet frozen treats will definitely be a hit… but you might still need a bowl because ice cream is messy! Enjoy!! Leave the ice cream out for an hour or so to soften it enough to be able to spread in the pan. In a food processor, grind the sugar cones until smooth. Add 2 cups of the smooth cones to a bowl and mix in the butter and 3 tablespoons of brown sugar. Stir until combined and press down into a buttered 9x9x3 pan. Pour the first layer of ice cream into the pan and smooth evenly with a spatula. Freeze for 10 minutes. Add the 2nd layer and smooth over the first. Freeze for 15 minutes. Pour the 3rd layer of ice cream over and smooth. Freeze again for 15 minutes. Add in the popsicles sticks and freeze for several hours or overnight. You can cover using tin foil. I love these layers, what pretty pops!